You have an idea and with all honesty – you believe it is worth gold! And thus, you thought of running a crowd funding campaign for raising funds for your idea so that it can take the shape of reality. Unless of course no one else agrees with you. 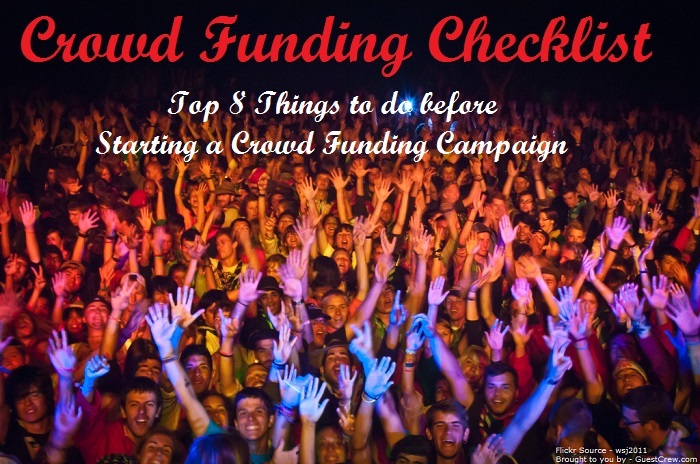 Before you start a crowd funding campaign, you need to plan a few things. Starting with – time, you are going to need plenty of it, some funds to market your idea and a base on which you will market it. Talk to yourself, give it a few days time – and Think. Most ideas sound great at start but they might not be. Do your research – Google your idea. See if there is something related on the market already. Go to sites like Quora or Yahoo Answers and see if there is a need for your idea. Once you have done your research it is time to make some notes. Write down your idea. Determine the niche of your idea – say your idea has got something to do with, technology, social media, gardening, food – see on what niche you are on exactly. 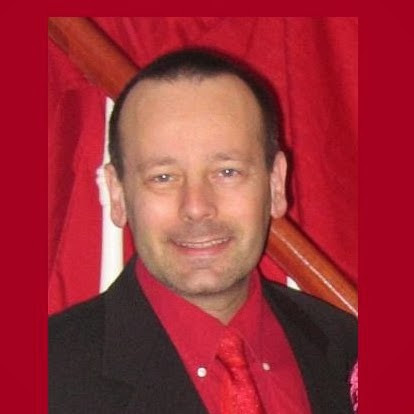 Then it is time to go deep into your niche – find blogs, forums, facebook and linkedin groups, twitter influencers etc. related to your niche. Start interacting and get a feel of the niche. See if you like the niche – that will also increase your own knowledge of the related niche and perhaps even the product in concern. Give yourself at least a few weeks time before you start further. You need to invest some money at this stage – it is not much, just the bare minimums. Get a Domain. You need a very good domain name, something that is related to your product – it could be the name of your product. Take your time and do proper research before registering the domain. Get Web Hosting. Generally web hosting starts from $3 to $10 a month depending on which host you choose. You can try out HostGator. GuestCrew is proudly hosted on Hostgator – you can easily get a webhosting account for less than $4 a month! Do signup on our newsletter, we keep sending discount coupons for web hosting and domain names. Get a landing page. This is going to cost you – no less than $200 to $400 depending on the designer you hire. The alternative is to install wordpress and setup a free blog and use it as a landing page of some sort. Get an Email service. You can try out Mailchimp which is free for first 2000 subscribers – it is pretty good. Alternative you can sign up for Aweber which is great but also cost $19 a month. You can test out their trial offer at $1 a month – but I must warn you, Aweber is really good and you might end up subscribing to them at $19 a month eventually. Additionally, you can opt. for the best email service – Get Response if budget is not an issue. Once you have selected an email service you need to configure it with your landing page. If you are going with a standard wordpress landing – then you have free plugins that will do the job. But setting up the subscription button is only the first step. You have to configure a series of Auto-responder emails to keep the subscriber busy and active. It is important to validate your idea at this point. However, the reason why I suggest you to setup the base first before doing the validation – because this step is a marketing step. You will not only validate your idea but also get a marketing boost, product promotion and awareness along with subscribers. Start a Crowd Speaking Campaign: Let the crowd decide if your idea is worth pursuing. When you run a crowd speaking campaign, people support the campaign by their social profiles at Twitter, Facebook, Linkedin etc. If your campaign is no good, you won’t get a lot of support. Thus you can determine if a campaign is worth pursuing or not. With every social support the percentage increases – which shows how popular a campaign is. On the due date of the campaign – which can be the launch date of your crowd funding campaign if you wish, all of these buffered social shares will be automatically posted on your campaign page. This way, you will create a buzz for your product and at the same time get a market feedback as well. You are far from creating your crowd funding campaign at this point. 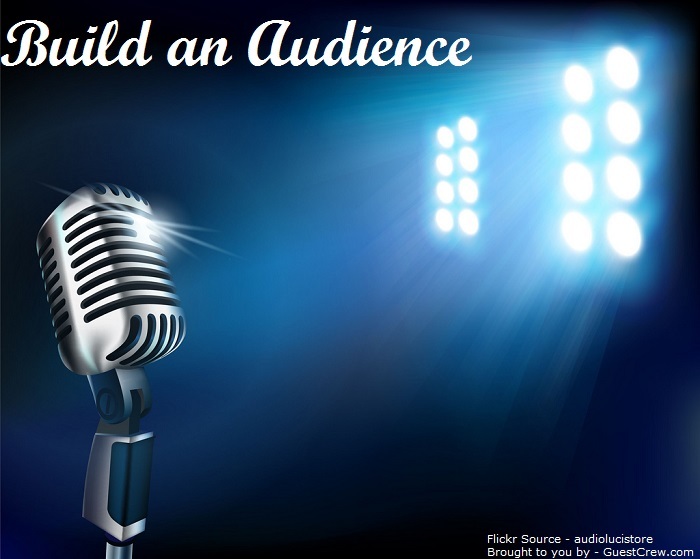 Your primary target now should be to build an audience. This audience, in time – will be your very first backers. Most successful crowd funding campaigns reach half their funding goals in the first few days of starting the campaign. Such a thing is only possible when you have loyal supporters. Get active on Social Media – Create social profiles on sites like Facebook, Pinterest, Reddit, Google+, Twitter etc. But creating profiles alone won’t help, you need to be active on these sites and build a following. Here are some marketing tutorials we already have that might help you get started. Feel free to join some of the smaller social sites and promote your relevant updates. An active blog is the first thing you want to have before you proceed any further. All the marketing you will do, the email list, the social media sites – everything should bring back the benefits to your blog. It is the central base of all your marketing activities. Along with that you can also maintain an active blog in 7 other places that can help you build an audience further. Yes, I know that is a lot of work – did I told you it will be easy? 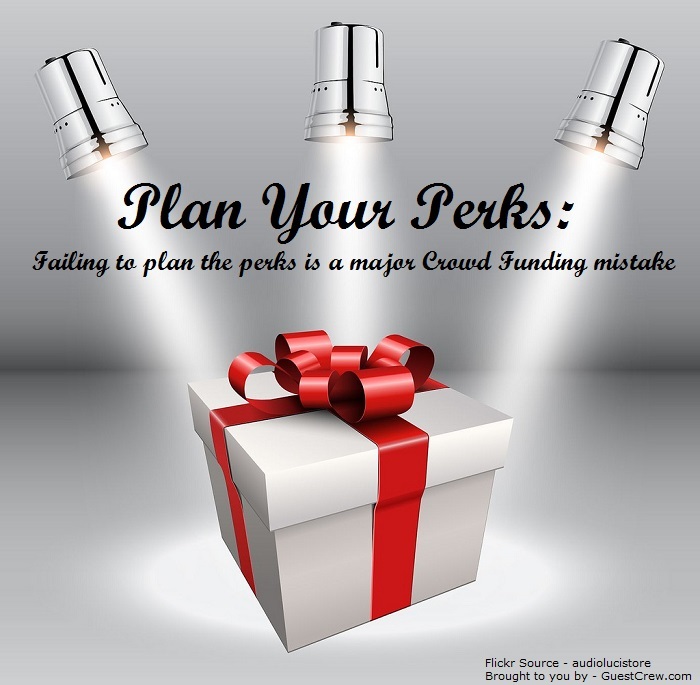 Failing to plan the perks is a major Crowd Funding mistake that most of the campaign creators do. Most of the backers who are looking to support a campaign mostly do it for the perk. If you aren’t providing enough value through your perks, you won’t be able to attract enough backers. Here are some tips to plan your perks. 1) Add a $1 – thank you – perk. It is cheap, thus it becomes easy for the normal backer to be a part of your campaign by spending as little as $1. 2) Add a $5 and $10 perks – This is a quick way to raise some funds without giving anything of value in return. Say, a personalized thank you email, or a mention from the official twitter handle of yours, or a mention in the “thank you” section of your website. Anything that makes the backer part of the project will do. 3) Add a $15 to $25 Limited Edition Perk of your product – This will surely not work if your product is expensive but there are other workarounds to it. Giveaway a part or a component or something that compliments your product as a limited edition perk. Open it up in a range, start with for example $19 and limit the number of products to 50. Once it is all gone, set the next batch at $25 and so on. 4) Add an expensive perk – Something on the higher range from $400 to $5000+ – Target this towards the business end, for example – “Take a Business partner” or something. You can even invite these people to your launch party. This is not just a suggestion, if you are on kickstarter this is a rule to begin with. But either way, you need a working prototype else you can’t get consumer trust. Make sure your prototype is working and has the full features of your final model. That way you can take plenty of pictures too which can be later used for marketing. This is where you get serious and start to devote some real hours into your product. We discussed social media previously, but that alone is not enough. You have to utilize all the promotional channels you have. Join Forums related to your product. If your product is a home utility then forums targeted mothers will be your right fit. There are forums targeted to crowd funding, be active on those too. Their members are people like you – campaign Creators – spend time and learn about what challenges others faced and learn from their mistakes and achievements. Do blog commenting on blogs related to your product. When you make the comment, make sure to put your blog’s URL in the link field of the comment. Make useful comments otherwise your comments will be marked as spam. 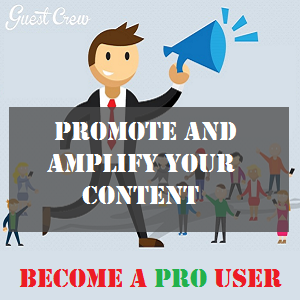 Use Content amplification services to promote your blog posts. If no one read your posts, there is no point having a blog. I liked the point which says maintain a blog. Content marketing is a great way to gain traffic, audience, and conversions. 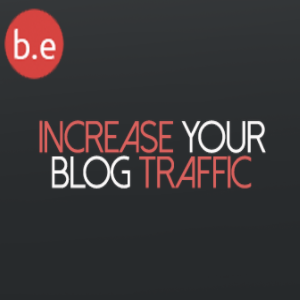 Maintaing a blog can help us rank higher in searches and thus derive more people to it. Crowd funding always has been a topic of interest, although I never tried it. I guess I will try it when I start-up my own company.. Crowd funding campaign can be run to launch a service, ebook or just about anything, you don’t need to start a company or anything major for creating your campaign. Thanks for this wonderful comment of yours and welcome to the community. Crowd funding is something you’ll really have to try and see what impact it creates for your business. And yes, maintain a blog is of utmost importance for every marketer because it can really perform wonders if handled well. Thanks for stopping by once again and please, do come again :). That’s a really informative and helpful post. I haven’t really had cause to use crowd-funding, although I’m familar with the concept. I’ll share it on social media as it may be helpful to some of my contacts. Thanks for the share and welcome to Guest Crew Community. 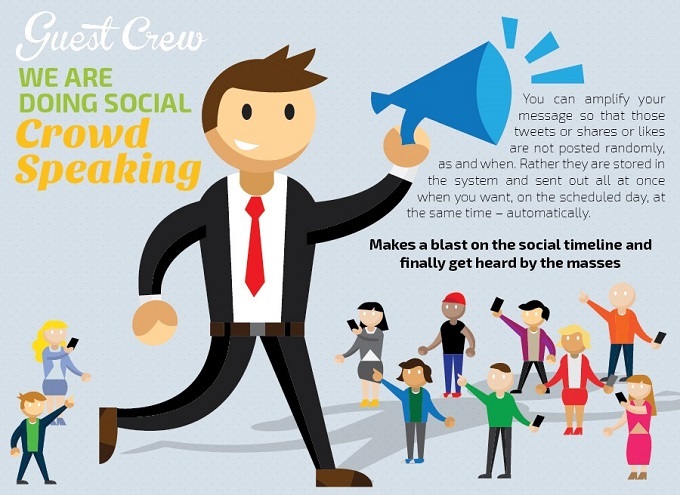 Crowd funding is actually a topic that sounds strange to most marketers but its good you try it. I’m really pleased to have you here Joy, please do stick around. This is a totally new concept for me. But I thought I would read it to get a idea about what crowd funding is. There is a lot of work involved. I think I will continue to practice blogging. Thanks for an informative post. Thanks for your comment. Indeed, the concept of crowd funding is a subject many people finds strange but its been there for long. You just need to take a closer look at it and once you do, you’ll find out that it’s actually simpler than you thought. But if what you’re doing on your blogs is already working for you then move on with it. But its good to try something new once awhile and see how it goes. I’m glad to have you here Rachael and hope you’ll stop by again.